In the European Union, public procurement accounts for 14% of GDP demonstrating the high potential of public procurement to support policy objectives, to stimulate innovation and hence, jobs and economic growth. But current public procurement processes are struggling to keep up with the fast pace of digital innovation and data-driven solutions in key application domains such as smart cities & communities, health-care and energy. As a result, public administrations and their communities are not reaping the full potential of digital transformation through public procurement. Public procurement as a tool has largely failed to help administrations and companies cross the ‘valley of death’ for digital and data-driven solutions between small-scale experimentation and real-life scale-up across Europe. The net result is a European digital transformation with brakes on due to the inadequate risk profiles along the innovation cycles. Strategic cooperation and interoperability between public administrations across Europe can help to lower the risks for first movers while helping SMEs to create scalable markets for innovative solutions across Europe. 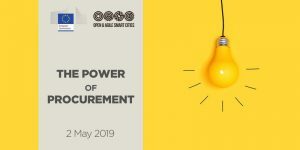 Stimulate a debate on the benefits and shortcomings of public procurement processes and how to fix the shortcomings to benefit both public purchasers and the local innovation ecosystem. Explore possible ways forward in deepening the European cooperation in procurement of innovative IoT solutions and services.